The Yardbirds spawned three of Rolling Stone’s top five guitarists of all time with seven Hall of Fame inductions among them. 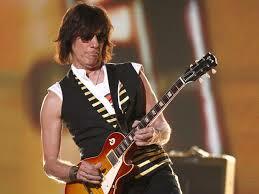 Oddly enough, Jeff Beck may be the X factor of the rock god trio that includes Eric Clapton and Jimmy Page. Led Zeppelin and Clapton don’t have to exactly clamor for recognition in music history among the tens of millions in the 18-34 demographic but mention Jeff Beck and you’ll likely get a few empty stares in the coffee shop. Greensburg, PA’s Palace Theater landed his final solo tour stop before he co headlines with ZZ Top. If you’re a neophyte, the great thing about a Jeff Beck show is that you really don’t need to know any lyrics; there are none save for a few choice covers that were more than capably handled by Wet Willie vocalist Jimmy Hall. Ironically, Beck’s iconic interpretation of “People Get Ready” has rarely been played on this tour. A mesmerizing version of the Hendrix classic “Little Wing” has become the showstopper. Drummer Jonathan Joseph and second guitarist Nicolas Meier round out the ensemble. They blasted through a myriad of songs for over two hours from a long musical life: from his fusion days with “Led Boots,” from hanging out with Tim Bogert and Carmen Appice with “Superstition,” from his Grammy-winning days with the re-imagining of the Beatles’ “A Day in the Life” and from his ’80s period with “Where Were You,” a beautiful ballad from 1989’s “Guitar Shop.” Unlike many virtuosos, Beck does not use a pick and is less a wall of technical dissonance and high volume than a finesse multi genre stylist. Beck is not your typical guitar hero. In fact, his goal is to make you forget that he plays guitar.